Serve merlot or cabernet red wine to accent this intimate dinner of Rosemary Grilled Lamb Loin Chops with Cranberry and Peppered Apple Relish. 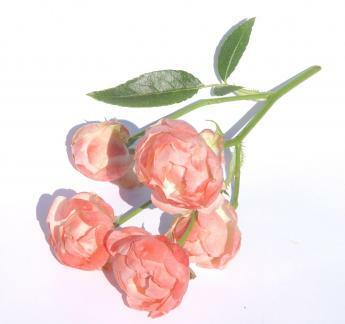 (ARA) – Looking for a simple recipe that exudes elegance and romance to serve that special someone on Valentine’s Day? 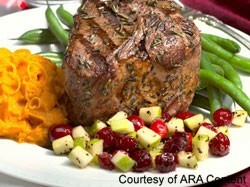 Chef Brooke Vosika of the Four Seasons Hotel in New York City suggests American lamb to make an everlasting impression. “American lamb is truly the lobster of red meat,” says Chef Vosika. Lamb is a universally popular and traditional meat regularly prepared for family meals and celebrations in the home. Here in the U.S., domestic lamb is freshly available for a high-quality meal. And, American lamb’s sweet, mild flavor and versatility lends itself to endless culinary creations. Chef Vosika recommends Rosemary Grilled American Lamb Loin Chops with Cranberry and Peppered Apple Relish this Valentine’s Day. Grilled to perfection and accented by the red hue of the cranberry and peppered apple relish, this dish creates a memorable dining experience. “This recipe uses the best of winter fruits — apples and cranberries — that complement the rosemary scented lamb, perfect for an intimate dinner,” continues Chef Vosika. When shopping for fresh American lamb, the first stop is the local butcher or the meat counter of the grocery store, and pre-order whenever possible. Look for meat that has soft pink to red coloring with white marbling. The remaining recipe ingredients are all available at most grocery stores. Accentuate this intimate lamb dish by pairing it with a hearty merlot or cabernet wine. Red wines offer adequate tannins to work well with the rich lamb chops and often have herbal nuances that pair well with many herbs, especially rosemary. From start to finish, this classic Valentine’s Day dish is ready to present on a candlelit table in under an hour. Tip: This relish is best made a day ahead to allow flavors to blend. Combine olive oil and rosemary. Dip chops in mixture. Season with salt and pepper. Cover and refrigerate for 1 hour. Grill over medium-hot coals about 20 minutes or to desired degree of doneness. Use meat thermometer to test lamb, medium-rare 145 degrees F, medium 160 degrees F or well done 170 degrees. Serve with Cranberry and Peppered Apple Relish.